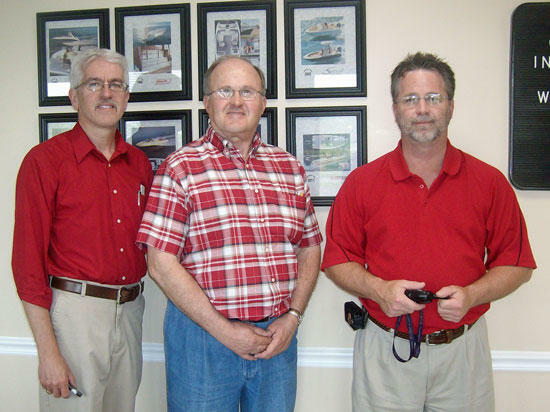 Left to right: Mark Scott, Larry Officer, and Donnie Cromer. "As long as blood is shed, I will wear red!" On March 30, 2012 in observance of Red Friday, a tradition keeping our troops in the hearts and minds of those they and their families sacrifice daily for, Crane Interior management Mark Scott, Larry Officer, and Donnie Cromer, as well as near 50% of plant employees by the collective display of the wearing of red proudly exhibited their support for America's heroes. Photos were taken throughout the plant to be forwarded to LCpl. Philip Mark Rhyne, USMC and his brothers and sisters in arms. LCpl. Rhyne is currently on his second tour serving in Afghanistan in defense of the freedom of others and the well being of the country he loves. Completing on Oct.7, 2011 the IED Detector Dog Handler Training Course in preperation for his current deployment, serving in austere conditions he stands for all those he loves here in Cannon Couty as well as elsewhere, and those he does not know. His son 1yr.5 months waits patiently for the return of his "dada". A 2008 graduate of Cannon County High School, God be with you LCpl. Rhyne and all our heroes, bless you, keep you safe and bring you safely home! Let us not forget as we go about our daily lives the reasons we are able to do so and continually keep them in our prayers. We thank you each and everyone and recognize the sacrifices made in the name of freedom. Freedom is not Free! LCpl. Rhyne is the son of Teresa Danford, an employee of Crane Interior.